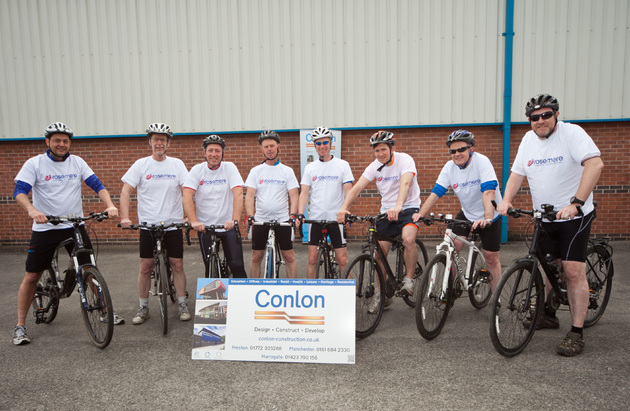 A team of cyclists from Preston based Conlon Construction Ltd is taking on the stunning ‘Way of the Roses’ cycle ride to raise funds for the Rosemere Cancer Foundation. The nine riders will set off on the 170-mile sponsored bike ride on 19th June, with the aim of completing the challenge in three days. The Way of the Roses is a spectacular coast-to-coast cycle route passing through both the red rose county of Lancashire and the white rose county of Yorkshire. The ride is challenging but takes in some of the country’s finest landscapes - starting off in Morecambe running through Settle, up over the Pennine Hills, then Ripon, York, and ending in Bridlington. Each year, Conlon Construction selects a company-wide charitable activity to raise money for a worthy cause. This year, the company selected Rosemere in support of its former Chair, Theresa Noblett, who has adopted the cancer charity as her chosen charity for 2014 and is undertaking a number of fundraising initiatives. Inspired by the Tour De France and the recent Brits' success, Darren felt that the iconic cycle ride was the perfect way to fundraise for Rosemere and was also a good way of building allegiances with Conlon’s new office in Yorkshire. The ‘Conlon Peloton’ includes Divisional Director Darren Lee, Simon Brown, Shaun Smith, Alan Cragg, Richard Forshaw, Andy Makinson, James Dyer, Michael McLoughlin and Nigel Beeden. Darren continued: “None of us are professional riders – we're all different shapes, ages and levels of fitness - so this is also a great personal challenge for us all. To support the Conlon team please email Fiona Riley fiona.riley@conlonconstruct.co.uk. To find out how you can help the Rosemere Cancer Foundation, please contact the Fundraising Coordinator, Laura Stephenson on 01772 523728. You can follow Rosemere Cancer Foundation on Twitter @RosemereCF or visit us on Facebook www.facebook.com/Rosemere-Cancer-Foundation.